This is the actual embroidery machine in action. We visited our sock manufacture in Nara. It was so fascinating to see how much work and how many people involved in making of BONIKO socks. Here is the machine in action to set the socks in the plastic frame to be embroidered. Right quality of the backing paper is vital for the finish here. Apparently we had 14000 visitors during 3days. Having a Currier company at the venue, bumping in / out went smoothly. We managed to sell / give away some props and furniture. The only surprising fact was that we had to take all the rubbish with us! 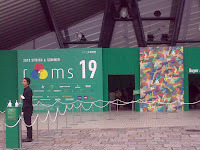 BONIKO was a part of ROOMS 19 exhibition in YOYOGI in Sept from the 16th to the 18th. Great location, having Harajuku shopping area right next to it. We wish we had more time to look around but didn't have energy left after the big three day. It was so full on....travelling on the train in the rush hour was very interesting! They are the cutest creatures in the world. We even gave a go with spinning yarn from alpaca fleece. It was hard at first but turned out to be fun and really therapeutic experience. You may see Alpaca-Boniko soon??!! Well I am getting a spinning wheel for sure!! Finally got around to get our blog going.... YAY! 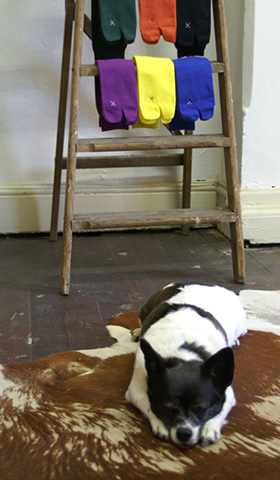 We are in Melbourne exhibiting at Design Made Trade at the moment.